Living in central North Carolina I have four options for skiing about three hours’ drive time from my shop door, which in the winter months starts to resemble a snow sport consignment outlet. I would love to be closer to any of the four but at least there is some variety within a reasonable distance for day tripping. 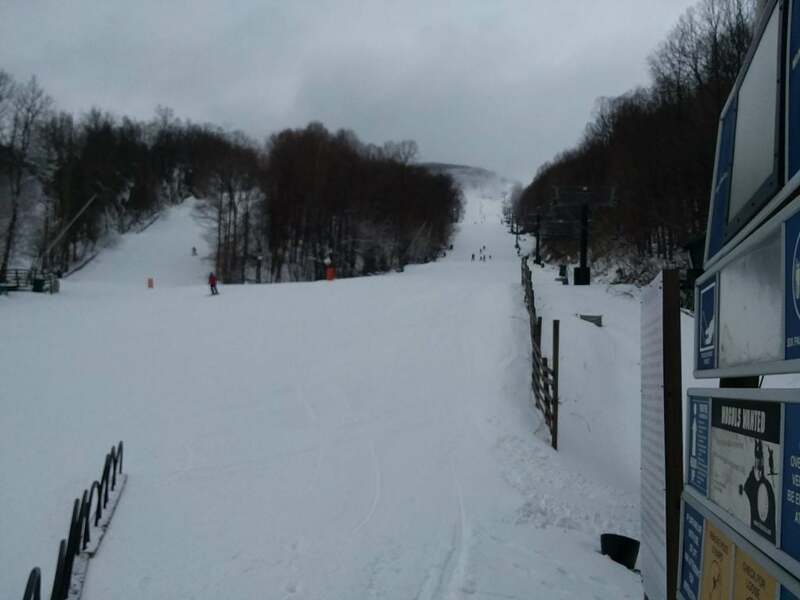 I had already managed some days skiing in the North Carolina High Country but have been waiting to get my first runs at my closest northern option, Wintergreen Resort in Virginia’s Blue Ridge Mountains. All the pictures here were taken during a one-day session last Thursday; although I have an archive of memories from Wintergreen, digital and old school glossy paper, of short sleeve bluebird days and deep winter mornings that could crack the thermometer. All those memories return, but I’ll stay in the moment for now. 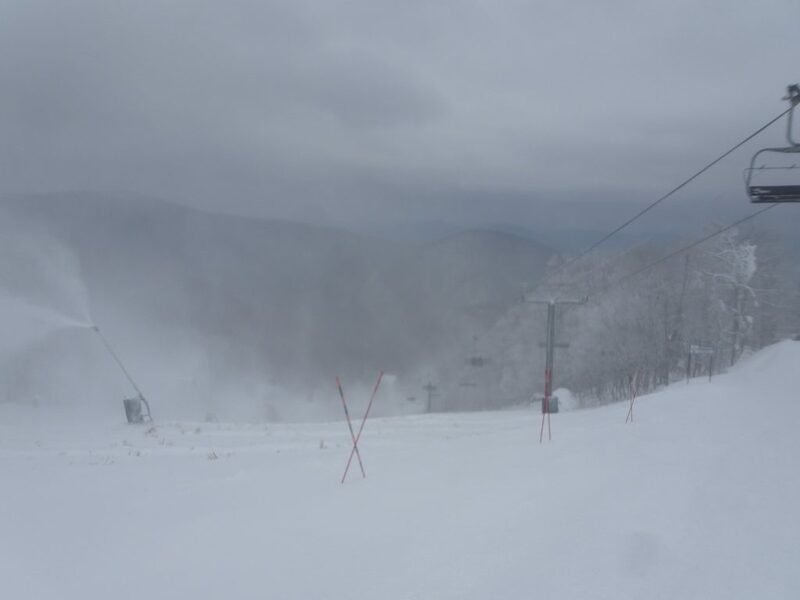 Options: access to Big Acorn Lift, forward and right; Blue Ridge Express forward and left. Wintergreen is one of my favorite Southeastern resorts, I have a soft spot because my sons’ first overnight trips were spent there. 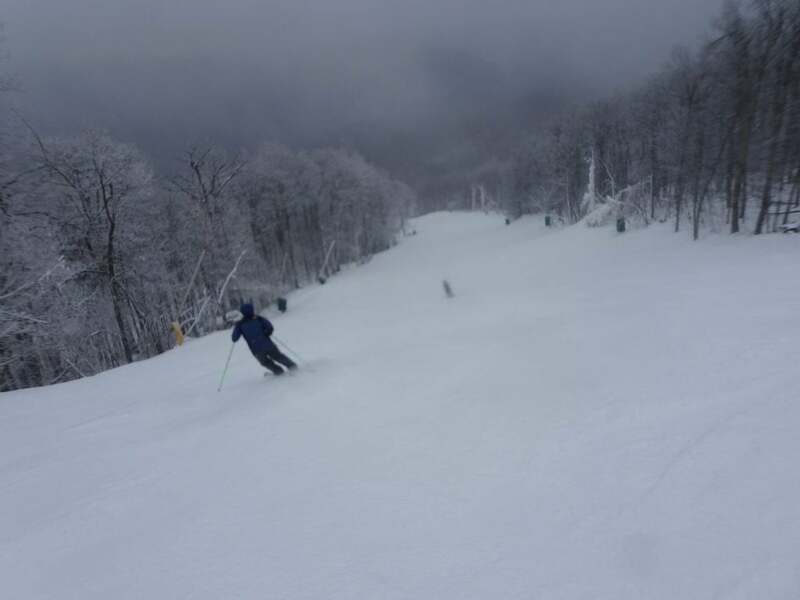 They had already learned the basics, but Wintergreen was where they started getting “good.” This was lucky for me because as they were climbing that curve, I was able to enjoy some of the best terrain in our region on my own and soon enough with them. 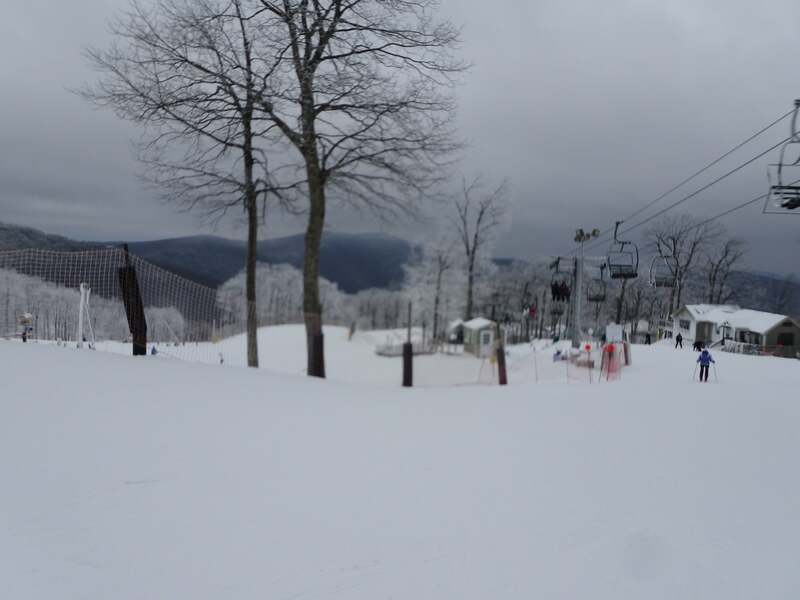 Wintergreen’s top is still a learning mecca; staffed, resourced, and intelligently laid out to get little ones ripping, and adults comfortable with a new sport. Sport? Rather let’s say obsession; or in my case an almost unrelenting need; enter at your own risk I suppose. Dedicated starter Lift, a good place to learn the art of loading and unloading. Click to Enlarge! 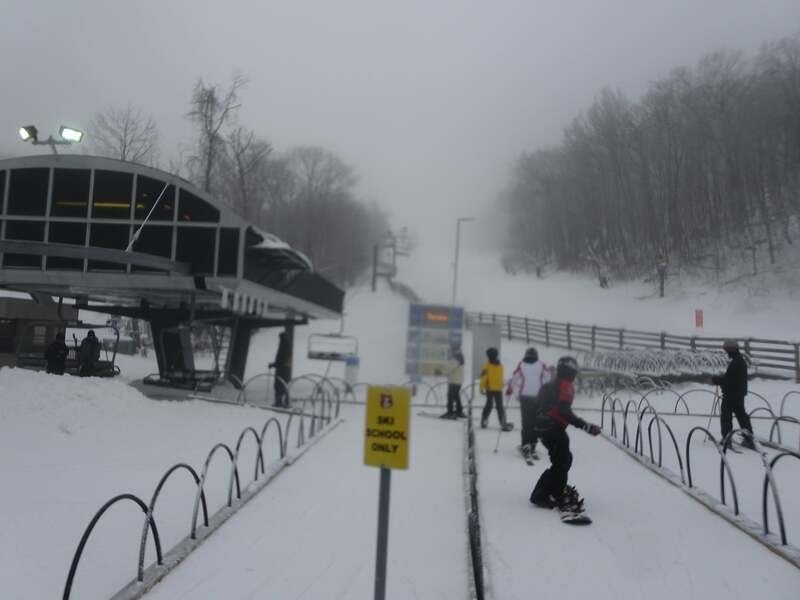 At Wintergreen, the three main lifts each have separate, and defined, though overlapping, boundaries. 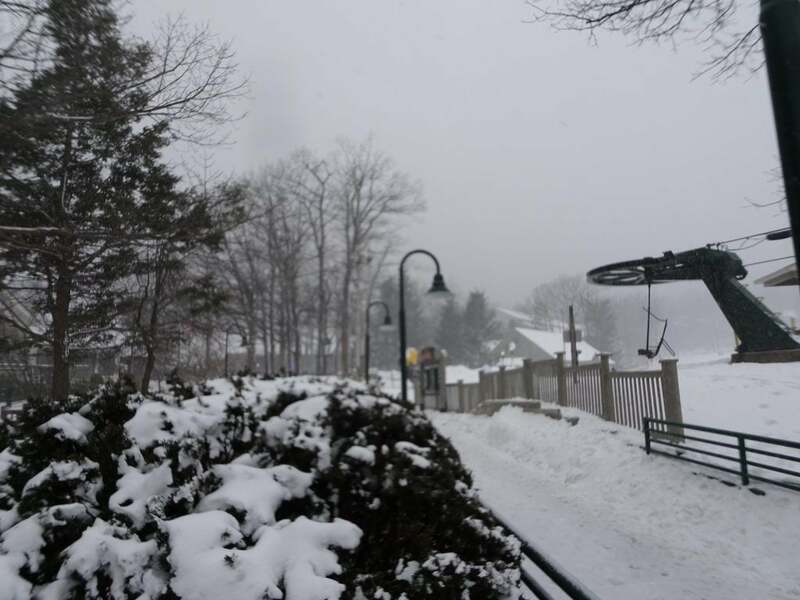 As you ski down the main slopes beneath the learning area you are in the region served by the Blue Ridge Express, a high-speed six-pack with wide, blue and green runs. The terrain park between those runs was still being buried under an onslaught of snowmaking; and when they open fully, it’s always amongst the best. Probably the shaping of features will begin in earnest this weekend. I did not have any conversations this time but in years past I’m always taken aback by the credentials and experience of the people doing that work. They are not the bro-bro-dudes you might imagine. Still, luckily for them, and for all the park rats; conditions being imperfect, I could not put them to shame with my own skilled moves this time. Notorious Old Guy will wait till all is ready in upcoming visits. 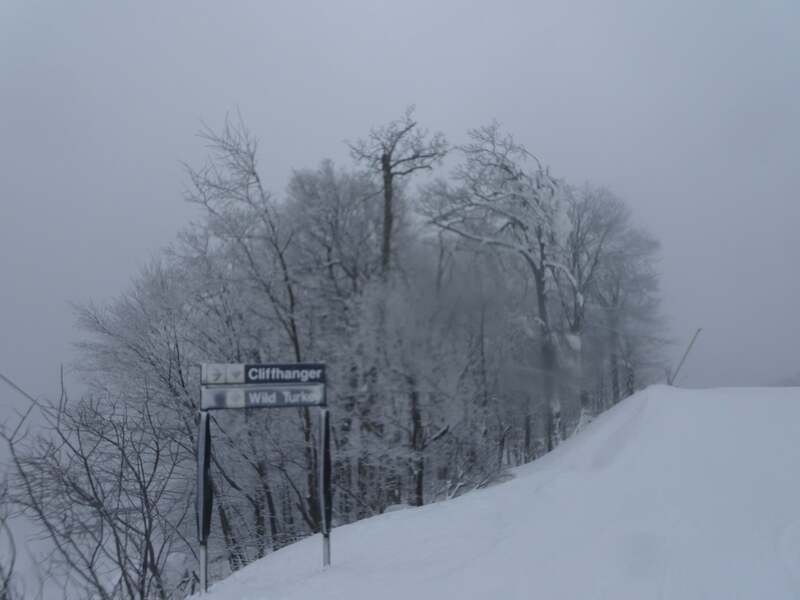 The Big Acorn lift has a circle of runs connected by skiing through an underpass to the Blue Ridge Express area. They are mostly Blue to Black but have fairly steep pitches somewhere within every run. 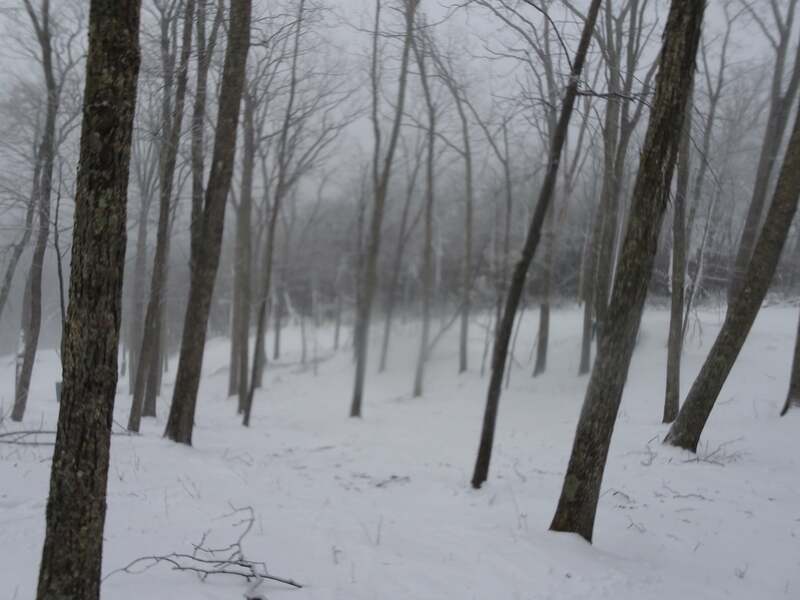 Wintergreen has committed to moderately thinning a steep natural tree run right in the middle, by Sunrise, appropriately called Sunrise Glades. There is no snow making within it, although some gets blown across it, natural coverage is required. I got in there this time and it was twiggy but fun. 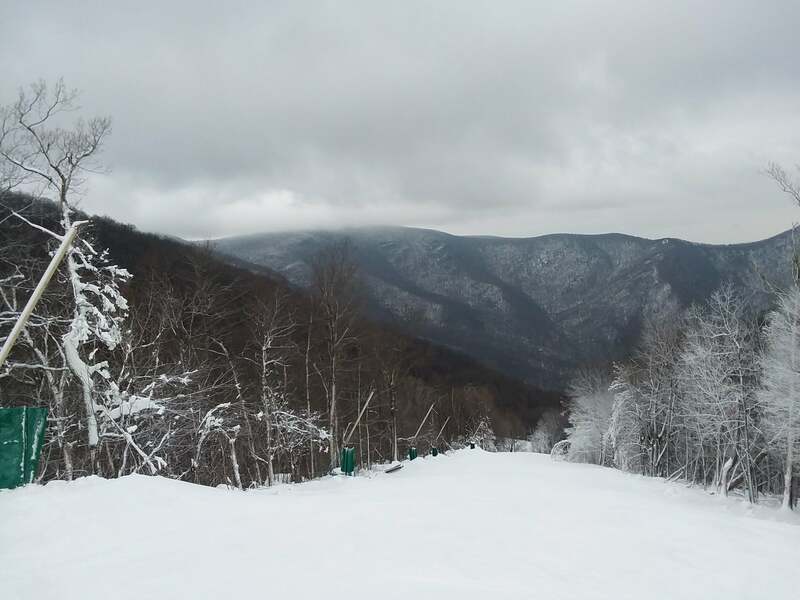 I want to thank Wintergreen for keeping it open for those of us with a deep need for trees. I love the Big Acorn Lift, and Eagle swoop, and Tyro; for their generally old school feel and great night skiing. Night skiing can set a trip apart; those are often the best and most unexpected runs. 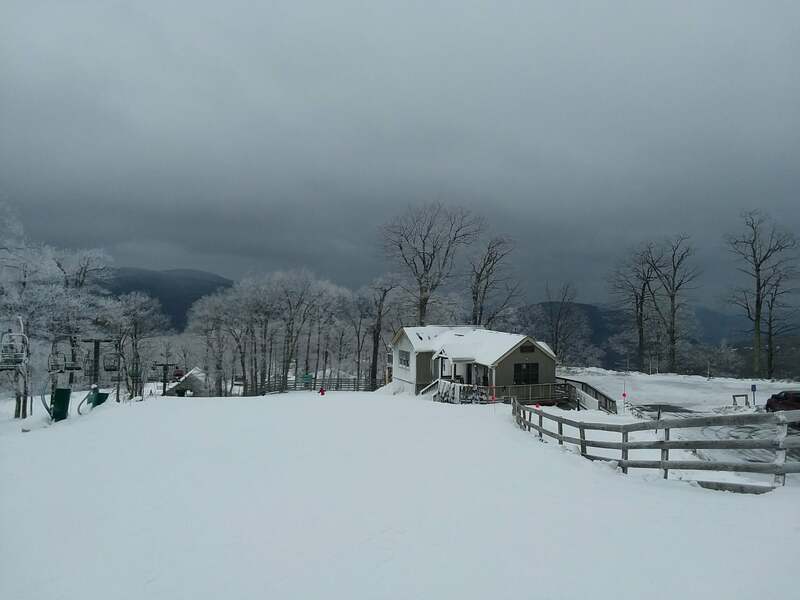 Some years ago, I stayed slope side at Wintergreen with my somewhat contentious family; and many of us skied off and on from 9am to 9pm. As a result, we rarely fought; we were just too exhausted and happy. Perfect location for family therapy. The Highlands Express is a high speed detachable 6-pack lift that serves what I am dividing as the third and longest part of the mountain. It is also the steepest. 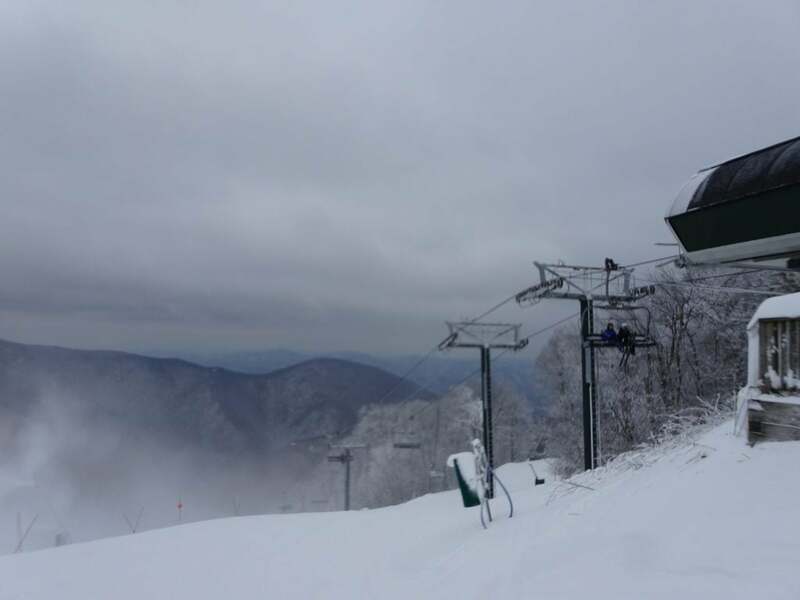 On skiers left, as you come to the bottom of the Blue Ridge Express, you can keep on going past the mid-mountain Checkerberry Cabin (or stop and get some food and cocoa or draft micro-brew) and drop into the Highland runs; which are marked with large EXPERT ONLY banners. Undoubtedly you should at least be adept, but for some (mostly men who are already caked in snow) the designation of EXPERTS ONLY is less a warning than a challenge. I’d like to change such signs to BE COMPETENT; which sounds much less like a dare. However, they are designated, these runs are bigger, steeper, longer; and from my point of view, the most fun on the mountain. The Highlands Express serves 1000’ vertical feet and the ride takes 4 minutes and 40 seconds. If you like listening to tunes on the lift ride that makes it about the exact length of the Stones’ “Gimme Shelter,” or of the entire Ramones song catalogue. 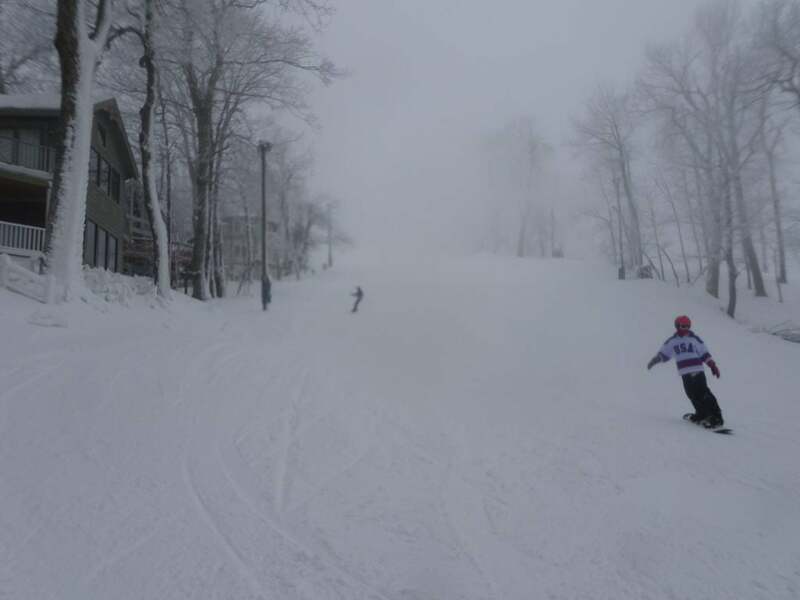 There are only three lifts in the entire Southeast that serve 1000 vertical feet and no others in under five minutes; in other words, Highlands serves up the fastest hot laps in our region. 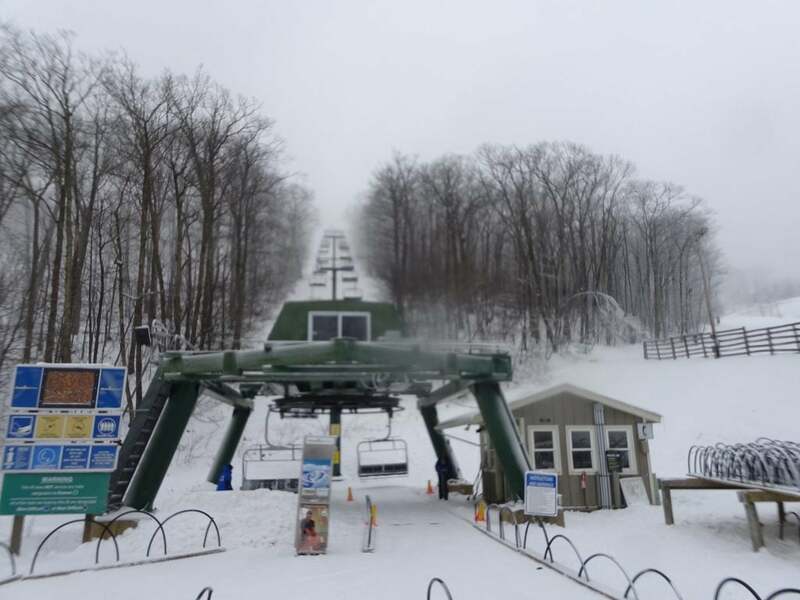 These comparisons may seem untoward, but I make them because so many people I talk to south of Virginia don’t know that along with its intermediate and learning terrain, Wintergreen has some of the longest and best lift served expert terrain in the region. And all that usually with little to no lift line. There has always been a controversy about the negative impacts of high-speed lifts. 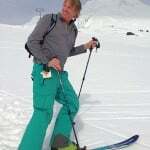 The argument holds (with good evidence) that faster lifts put more people on the mountain and cause congestion. But the Highland Express is serving nothing top to bottom but the people who want to keep lapping long steep runs. You can step in or out anytime via Loggers Alley or at the end of Diamond Hill. Or just keep going until your legs give out and your competence is in question. When they have the window, Wintergreen’s snowmaking crews can open new terrain fast. Here’s Upper Wild Turkey getting blasted on Thursday. Saturday morning it was open. This was a great visit, and I was so glad to return for the season. The snow gods chose to mock me as I was leaving late afternoon, by dropping some heavy beautiful snow for others to track as I was driving home…but I don’t begrudge them. In fact, I intend to return next weekend and make even more tracks of my own.